Corte dei Miracoli | Just Visit Siena ! 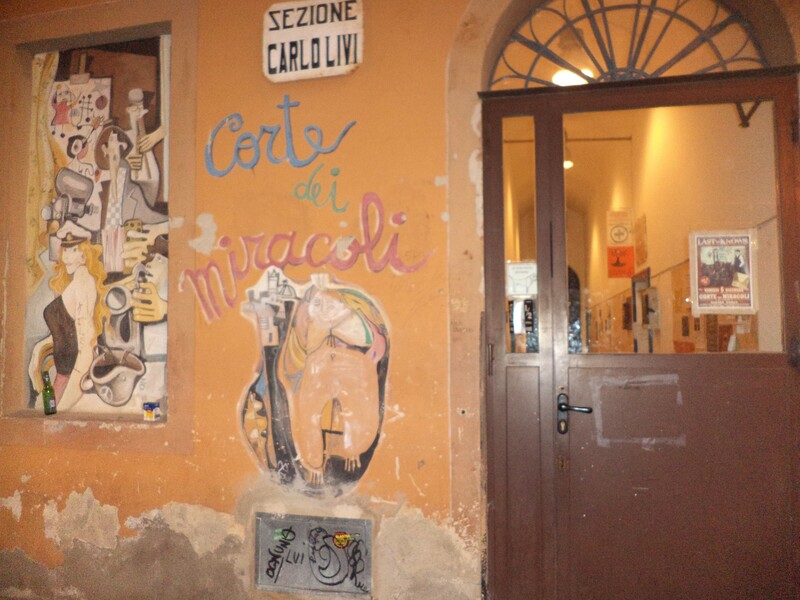 Today few words about Corte dei Miracoli that during the colder weekend’s evenings is one of the best place to drink something and spend a nice time! For me personally a place that organizes very good concerts. But not only this you can find there (www.lacortedeimiracoli.org). It is a cultural, non-profit, social promotion which operates on the territory of Siena through the design and testing of forms and solutions in the social, artistic and cultural heritage. For years Corte dei Miracoli has engaged in an information, advice and assistance in the promotion and protection of the rights of citizenship. Its very interesting location for sure will attract you to enter. Cause Corte dei Miracoli is located in the former Psychiatric Hospital St. Nicholas (via Roma 56). In its activities presents diverse aspects of art, from theater to music as well as the visual arts. Everything gives interesting intermingling between different languages and styles. Only here you can find Ambulatorio per migranti (that organizes and supports various initiatives); various courses for adults (such as yoga, flamenco, about plants, judo and other) as well as for children. It also organizes Italian courses on different levels. As I mentioned the most attractive are concerts that take place in Corte dei Miracoli. Just right here you can have an unique opportunity to participate in the concerts of Siena’s bands. I am sure that you should pass from this place and not only to take a picture under Ospedale Psichiatrico but also to bite a bit of culture during your stay in Siena and find out the uniqueness of this place (that is manifested in variety of styles). Because priceless are such moments and what is more they remind forever!